It’s high time to put down all your thick winter projects and start making something special for this spring! I’m organizing this SPRING CROCHET ALONG that will start in February and end on Wednesday, May 1st, 2019. Everybody who is able to hold a hook, read written instructions, know how to crochet post-stitches, and is a right-handed crocheter will make a crop top, a normal-length top, or a dress – whatever you wish to wear this spring! I have divided this pattern into several parts (not including this introduction) and suggested this schedule. Each part is possible to complete during one or two evenings. But this pattern became so addictive for the majority of crocheters that they preferred receiving new parts once they had had finished and uploaded a photo of the already finished part. So, faster and eager crocheters can finish one of these projects in 10-12 days. Do not wait longer to join us! Purchase yarn, link your project on Ravelry, start swatching as described below, and don’t forget to invite your friends 😉! All projects are crocheted from top down, starting at neck and working in the round to form neck opening and the beautiful leaf yoke. The top-down construction makes it possible to try it on as you go for the perfect fit. Length of all dresses can be also regulated, so you can crochet a mini, midi or maxi wedding dress. The dress above made my waist look wider (which is compensated by even wider skirt), and I gave it to my friend as her Christmas present. I have adjusted the waistline, so it is more refined and flattering. First 44 rows are worked the same way in all projects, then you will need to decide what to finish :). M with bust 92-96 cm (36-38’’). Hips are 15-21 cm (6-8’’) wider than the stated bust circumference. for size M-L with bust 96-100 cm (38-39.5’’), underbust up to 88 cm (35’’) take 940 yards (4 balls). For size M-L with bust 96-100 cm (38-39.5’’), underbust up to 88 cm (35’’) take 2250 yards (7.1 balls). M with bust 92-96 cm (36-38’’), underbust up to 85 cm (33.5’’) take 1320 yards (5 balls). M with bust 92-96 cm (36-38’’), underbust up to 85 cm (33.5’’) take 8 balls. If you are rather tall, add another ball. and 3.25 mm (D or E) for sizes M-L.
Make sure the gauge fits or use other hooks to obtain correct gauge. START now to be ready by March, 1st! If you share your photos on Instagram be sure to use these 4 hashtags #spring_cal #conceptcreativestore #crochetalong #freecrochetpattern so we can like them! cluster – several sts joined together at the top www.redheart.com/learn/articles/how-crochet-clusters (every cluster of this pattern will be explained on the need-to-know basis). I love how Redheart described all these stitches worked together, so I will write cluster of 3 fpdc instead of something unspeakable like fpdc3tog 😨 – I always stumble upon such long abbreviations 😨. Chain 26 (count as 23 ch of the foundation R.+ 3 turning ch), place 1 dc in fifth ch from the hook, work 1 dc into each ch across the R (= 3 ch + 22 dc in 1st R). In next rows work post dc sts around each of the central 21 sts. Crochet as you see them – the front one as the front and the back one as the back. Do not work post sts too tight! R.2: 2 turning ch, 1 fpdc around each of the central 21 dc sts, finish with 1 hdc in 3rd turning ch of prev. R.
R.3: 2 turning ch, 1 bpdc around each of the central 21 post dc sts, finish with 1 hdc in 2nd turning ch of prev. R.
R.4: 2 turning ch, 1 fpdc around each of the central 21 post dc sts, finish with 1 hdc in 2nd turning ch of prev. R.
Repeat R.3-4 six more times. Count that you have 15 “chain lines” created by outstanding upper parts of post sts on the wrong side of your swatch (or 16 rows totally if you count first row of dc-sts). You will see that the stitches remain elastic even in this solid-looking piece, while a 100% cotton would be stiffer. I would not recommend to crochet these stitches with anything thicker than Sport-weight yarn (for increasing the size of your project) and the same hook because you will compress the yarn into tighter post stitches. It can cause your project to be stiffer and very dense. Going up a hook size will impact the finished size because the armholes, bust, waist and hips will be lower than needed. Wash your swatch, stretch up and downwards (to test how post dc-sts in top part of the dress will be stretched downwards), lay flat to dry out, then take measurements of upper 12 rows and 20 post sts. for sizes M-L: width of 20 post sts is 8 cm (3.15’’); length of 12 rows is 8.5 cm (3.4’’). If the width is correct – Congratulations! You have chosen the right yarn! If the height of the stitches is wrong take a bigger hook to work longer stitches (because the length of your rows was smaller than stated in the pattern). And vice versa – use a smaller hook to decrease the length of your gauge (because the length of your rows was bigger than stated and the round yoke might end … at your waist :)). Your spot-on gauge will save your time! Please upload your swatch to Ravelry and notify me to receive the link to Part 1. Proceed to part 1 (will be sent to everybody who posted their swatch on Ravelry) – this link is deactivated because we end this CAL on May 1st. Proceed to part 2 (will be sent to everybody who posted their part 1 on Ravelry). – this link is deactivated because we end this CAL on May 1st. Proceed to part 3 (will be sent to everybody who posted their part 2 on Ravelry). – this part will not be sent to participants after April 20th because we end this CAL on May 1st. Proceed to part 4 (will be sent to everybody who posted their part 3 on Ravelry).- this part will not be sent to participants after April 22nd because we end this CAL on May 1st. Proceed to part 5 (will be sent to everybody who posted their part 4 on Ravelry). – this part will not be sent to participants after April 24th because we end this CAL on May 1st. Proceed to part 6 wide-skirt dress, top (will be sent to everybody who posted their part 5 on Ravelry). – this part will not be sent to participants after April 26th because we end this CAL on May 1st. Proceed to part 6 mini-maxi dress (will be sent to everybody who posted their part 5 on Ravelry). – this part will not be sent to participants after April 28th because we end this CAL on May 1st. Proceed to part 7 wide-skirt dress (will be sent to everybody who posted their part 6 on Ravelry). – this part will not be sent to participants after April 28th because we end this CAL on May 1st. Proceed to part 7 top (will be sent to everybody who posted their part 6 on Ravelry).– this part will not be sent to participants after April 30th because we end this CAL on May 1st. Proceed to part 7 mini-maxi dress (will be sent to everybody who posted their part 6 on Ravelry).– this part will not be sent to participants after April 29th because we end this CAL on May 1st. Proceed to part 8 wide-skirt dress (will be sent to everybody who posted their part 7 on Ravelry).– this part will not be sent to participants after April 29th because we end this CAL on May 1st. Proceed to part 8 mini-maxi dress (will be sent to everybody who posted their part 7 on Ravelry).– this part will not be sent to participants after April 30th because we end this CAL on May 1st. Proceed to part 9 wide-skirt dress (will be sent to everybody who posted their part 8 on Ravelry).– this part will not be sent to participants after April 30th because we end this CAL on May 1st. Will this CAL be prolonged if you have not finished it by May, 1st, 2019? Answer: No, these dates are final, thus you need to start this project soon. After May,1st all of these patterns will be offered at their regular prices. Browse the schedule 1 or schedule 2 and add the respective pattern to your Ravelry queue as soon as possible. Are you busy with testings or do you wish to finish another project(s) earlier? I’m afraid that this is a situation when you need to choose between projects. Make it for free now and wear this spring; or miss this CAL and purchase the PDF on my website whenever you want to crochet this garment. Will we have more sizes of these patterns? www.ravelry.com/patterns/library/futuristic-dress I’ve decided to make it without waist-shaping, but waves in this A-silhouette-dress created a flattering illusion. The most astonishing thing was that my belly completely disappeared (winter photos were taken after my abdominal operation, when I could not make crunches for about 6 months). It’s my most wearable crochet dress nowadays – it’s so unusual with its wavy 3-D accents that I named it #futuristicdress 😊. Why don’t we crochet with 100 % cotton? Answer: Because your cotton dress will be heavier, stiffer and more expensive. And you would not want to wear such a load in summer :). Premier Yarns Cotton Fair Solids is nice and affordable solution, so even if you crochet the dress with huge flared skirt for the biggest size you will need 8 balls of this yarn (cost $40-44 totally). If you crochet top for sizes XS and S take just 3 balls of if (cost $ 15-16 totally). I do not crochet garments with thick yarns – they might give you an impression of quick projects, but you spend more money on yarn than you crochet :)). And I try not to purchase expensive yarns (for example, my Freelancer Sweater required 1140 yards of www.ravelry.com/Scheepjes-Whirl for size M, which is just slightly more than one ball and costs about $12.50 in Europe. I do not want you to spend fortunes on yarns :). Why don’t we crochet winter sweaters with these yokes? Answer: I got several questions about sweaters after publishing my www.ravelry.com/patterns/library/futuristic-dress in January 2018 (most photos were taken in snowy December 2017). Five minutes were enough to realize that sheer yokes are my no-go’s in winter because they felt like an open-shoulder garment that let all my own warmth disappear through the holes in leaves. While I got lots of compliments on this dress in spring (wearing a spaghetti straps dress underneath), it looked almost casual when my shoulders were covered by that thin turtleneck sweater in winter. or you want to crochet this leaf-yoke jumper by Drops? This free CAL is for crocheters who can follow written row-by-row instructions. Off topic 😊 Since you love crocheting leaves, check out this interesting and free photo-tutorial by mypicot.com and download chart for it. Crochet two squares or rectangles with these beautiful leaves, sew sides and shoulder seams and you will have a nice summer top! Will this CAL be translated to other languages? Answer: This pattern can be translated into German / or French / or Russian if you find 15 friends all speaking one of these 3 languages and wishing to participate in this crochet-along now. Do not forget to mention that this CAL will be without any diagrams/charts/graphs – your friends will follow written instructions in German / or French / or Russian. All your friends agree on posting their photos on Ravelry and begin their projects on Ravelry as soon as possible. First part of this pattern will be translated into your language, but next part will be translated after all 15 friends have added respective photos of their first completed part on Ravelry, so you will depend on their crochet speed. Please contact me if some clarification/correction is needed in these 3 languages. Translation to other languages is impossible – please do not make any unauthorized translated copies of this pattern. Are the instructions in US or UK crochet terms? Answer: I describe all stitches in American crochet terms, but can translate them into British ones if you find 5 friends who need British instructions and wish to participate in this CAL now. 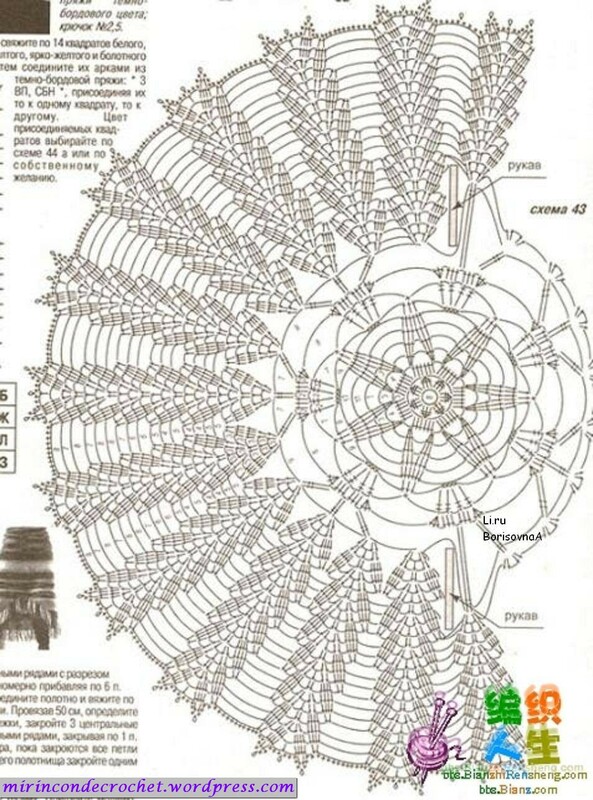 Do not forget to mention that this Crochet Along will be without any diagrams/charts/graphs – your friends will follow written instructions. All your friends agree on posting their photos on Ravelry and begin their projects on Ravelry as soon as possible. First part of this pattern will be translated into British terms, but next part will be translated after all 5 friends have added respective photos of their first completed part on Ravelry, so you will depend on their crochet speed. Will there be a PDF-printable version? Answer: PDF is available with the purchase of respective pattern on https://conceptcreative.store/ This CAL will be published on my website only, so once you have posted one completed part on Ravelry you will receive the link to next part within 12 hours. Will you be able to read next section if you have not finished the previous part? Answer: No, because this way I will see your progress and motivate you to continue the project 👏. All next parts will be published in accordance with the schedule, but they will be password-protected. Once you have uploaded photo(s) of one part you will receive a Ravelry message with respective password to access next part. No messages with passwords will be sent after April, 30th. What if I am behind the schedule? What if I would love to crochet faster and make this dress in 10 days? Answer: You started this project, crocheted for the whole night because you couldn’t put your hook down… 😍 Good news for you! I will publish each new section on my blog after looking at your result on Ravelry and receiving a message (like hi, I can’t wait to see it finished, please send me next part 😊 ). All links to next parts are already scheduled, but I will reschedule them and publish sooner! Please give me several hours because I might not be around (sleeping, working, eating or 🤧🤕😷) – you will receive the link and password to next part as soon as possible. Of course, all subscribers will receive updates that next section is published (and they might guess that somebody is ahead of them 🤔), but the password will be sent to them after they complete their previous part(s). Are instructions for right-handed or left-handed? Answer: Written instructions are for the right-handed crocheters. While left-handed crocheters will have no problem crocheting the first 11 rounds, there will be confusions with the direction for front and back (because left-handed crocheters work in the opposite direction than described in this pattern). The solution will be purchasing the respective pattern on https://conceptcreative.store/ and following the charts. Will we see any supporting photos during this CAL? Answer: Crochet basics are not illustrated, so you need to understand what it means to work 1 dc in 1 ch or 1 sc in 1 ch. We will use Front Post Double Crochet stitches, so please master them first. There are lots of free videos, for example: https://www.youtube.com/watch?v=vYlr-VsMWJg So, how to work 1 fpdc around 1 dc? Popcorn stitches (used in the dress with flared skirt), as well as several tricky parts will be illustrated with photos. Answer: Each person is unique and what is easy for one might be tedious for another. I already posted my opinion on levels here: https://conceptcreativeblog.wordpress.com/category/crochet/levels/ As a self-taught crocheter (like most of us) who prefers following clear charts I can tell you that … crocheting is not rocket science. If you just keep on hooking 😉. I labeled this dress as advanced because of so many different stitches. But if you followed written crochet patterns why don’t you take one ball of www.ravelry.com/yarns/library/premier-yarns-cotton-fair-solids (or some test-yarn of similar weight) and crochet first 11 rounds with us? Maybe it will be easy for you? You loose nothing! 😉Decide whether to continue with us after completing these 11 rounds :). However, this CAL might be difficult if you are used to photo-tutorials of every stitch intended for beginners. Can I purchase these tutorials on Etsy or Ravelry now? Answer: During this CAL you will be able to purchase them on my website only. Respective tutorials are labeled as FREE on Ravelry (alas, I can not post free patterns on Etsy because I pay fee for every listing, and then I pay for every transaction if this free listing is bought without reading it). All tutorials can be purchased on Etsy and Ravelry at their regular prices from May 1st, 2019. I have purchased this tutorial, posted my completed project on Ravelry (or Instagram) before this CAL started (before February 1st, 2019). Answer: Congratulations! 👍 You will be rewarded! All crocheters who have finished and posted any project from this CAL on Instagram before February 1st, 2019 and tagged me in their first post right away are kindly asked to post photo(s) of these projects on Ravelry. I will send each of you a coupon code for $6 that can be used on my website. Have you forgotten to post your finished garment prior to this date or tag me? Well, it looks like you missed it – please don’t be forgetful next time 😊. Photos and Row-by-row instructions that you will see during this CAL are property of conceptcreative.club, conceptcreative.store, conceptcreativeblog.wordpress.com, conceptcreativestore on Ravelry, conceptcreativestore on Etsy. Printable PDF includes colorful original charts. Any reprinting, transmitting, reproducing, publishing or otherwise using for commercial purposes parts of this tutorial is strictly prohibited without my prior written permission. You may sell as many ready made crochet garments as you want, provided that you post your own photos and give link to respective pattern by Conceptcreative.store on Ravelry. Or I make my first dc in the 5th ch OR I make 25 ch and my first dc is in the 4th ch from the hook ?! I’m glad you are participating! Actually, we have several crocheters with this pattern and suitable yarn on hand, who just could not find the right time for it :). I usually work more stitches for the gauge, wash the piece, and then measure the central stitches (without 2 first and 2 last stitches that might influence the total width). So, here we should measure 20 central stitches to see that the yarn is chosen correctly (not thinner and not thicker). Most people do not count the loop on the hook as 1 stitch, but there are some who do and then are short of one stitch. I usually state, when the loop on the hook does not count as 1 stitch, but for gauge it’s easier to count the total amount of stitches in row 1, 2, 3 etc. I think it’s good to crochet 23-24 stitches in rows with post stitches, then measure the central 20. I can change to crochet 24 stitches in rows and do not count the loop on the hook as 1st loop. Would you like me to remind you about each new posted part (on Sundays) or would you prefer to crochet at your own speed? I will look for yarn.